Providing an indispensable new A-Z reference to English usage for the twenty-first century, this guide covers more than 3000 points of word meaning, spelling, punctuation, grammar and style on which students, teachers, writers and editors regularly require guidance. It also addresses larger issues of inclusive language, and effective writing and argument, and provides guidance on grammatical terminology. Based on large international corpora, it differentiates clearly between U.S., U.K., Canadian and Australian usage and offers up-to-date, objective advice presented in readable, accessible terms. Pam Peters is a Professor of Linguistics at Macquarie University where she also serves as Director of Macquarie University's Dictionary Research Center. 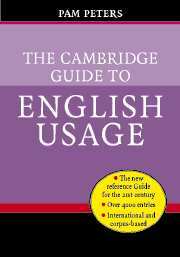 She is the author of several books on English usage, including Cambridge Australian English Style Guide (Cambridge, 1995). Preface; Overview of contents and how to access them; A to Z entries; Appendix I. International Phonetic Alphabet symbols of English sounds; Appendix II. Geological eras; Appendix III. Perpetual calendar 1901–2008; Appendix IV. International system of units (SI units); Appendix V. Interconversion tables for metric and imperial measures; Appendix VI. Selected proofreading marks; Appendix VII. Formats and styles for letters, memos and e-mail; Appendix VIII. Layout for envelopes; Appendix IX. Currencies of the world; Bibliography.